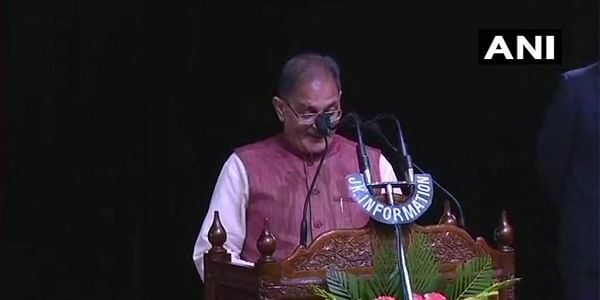 Dressed in kurta-pyjama and an 'achkan', Gupta, who was the J&K Assembly Speaker earlier, was among eight sworn in as ministers in the state government today. JAMMU: Fifty-eight-year old Kavinder Gupta, who will take charge as deputy chief minister in Jammu and Kashmir's Mehbooba Mufti government, first stepped into an RSS 'shakha' when in his early teens and for decades has been an active political worker, who even spent 13 months in jail during the emergency. RSS veteran Gupta took the oath in Hindi. Chanting slogans in his favour, Gupta's supporters welcomed him after the oath taking ceremony. "Kavinder Gupta will be the new deputy chief minister. He will lead the new team of ministers, who will perform their duties in the best interests of the people," BJP general secretary Ram Madhav told reporters. Gupta said his priority will be to ensure that the three regions of Kashmir, Jammu and Ladakh gets justice and equal development. "The party have given me the task. I will work dedicatedly for the people and the state and ensure that demands and aspirations of people are fulfilled," he told reporters. Born December 2nd, 1959, Gupta is a graduate, who has three children including two daughters. He was secretary of the Punjab Vishav Hindu Parishad in 1978-79. He headed the J&K unit of the Bharatiya Janta Yuva Morcha, the youth wing of the BJP, for two consecutive terms from 1993 till 1998. Gupta has also served as the mayor of Jammu for three terms consecutively from 2005 to 2010, which is a record. He has also been a general secretary of the BJP's state unit. He was elected as an MLA for the first time in 2014 from the Gandhi Nagar seat where he defeated a sitting Congress minister Raman Bhalla. Gupta was soon unanimously elected as the Speaker of the J&K Assembly. He is known for his work for the upliftment of the poor and downtrodden sections of the society as well as efforts to eradicate social evils.